We’re definitely not easing into October with our weather patterns. It’s been a cold week, but falling water temperatures are definitely setting up some predictable fall bites. We fished through a lot over the past several days including wind, rain, thunderstorms, and even ice storms. Seems a bit early for that… Despite the weather we’ve had recently, it’s still a beautiful time of year to be on the water in northern, Wisconsin. A last minute cancellation gave me an opportunity to fish with a new customer on Wednesday. It’s always good to have some new faces in the boat, and Wayne Fletcher (Hubertus, WI) joined me to chase muskies in the Hayward Lakes. He’s a Badger fan, so I knew we’d get along just fine… With a 5 musky day in the net from the day before, there was no reason to think we wouldn’t be able to connect. That’s why these things drive us crazy, and why they’re so awesome at the same time… Day #1 of a two day trip was a struggle for us. The first lake we hit had absolutely nothing going on, and we chopped water for a few hours without even a sniff of a musky. Definitely time to move! Lake #2 wasn’t a whole lot better although it did give us a chance when we had a fish hit and drop a sucker late in the day. We didn’t get skunked though… Right before quitting time, Wayne put the hooks into a low 30″s pike that grabbed one of the suckers we were dragging. Not exactly the intended target, but it was good to put something in the net. Wayne worked hard all day, and we covered a bunch of water. They don’t come easy, and this is why they’re so great! Water temperatures held around 60 degrees, and we had some pretty stiff winds and rain to deal with throughout the day. It must be fall in Wisconsin! We’ve got one more day to get it done Wayne. Those fish better be ready! The final trip from the Greg Lewis crew arrived on Thursday… I never get tired of having his guys in the boat and look forward to every trip we have. Jeremiah Andrews (Union, IA) and his buddy Marvin Brandt (Ackley, IA) were back in the boat, and we started our day on a crappie mission in the Hayward area. Well, we couldn’t find em… This season has anything but “normal”, and today was a good example. When crappies move to mud basins in the fall they usually don’t move until ice up. They’ve definitely moved, and I wasn’t going to burn an entire day trying to find them. We pulled out and switched lakes. Good move. 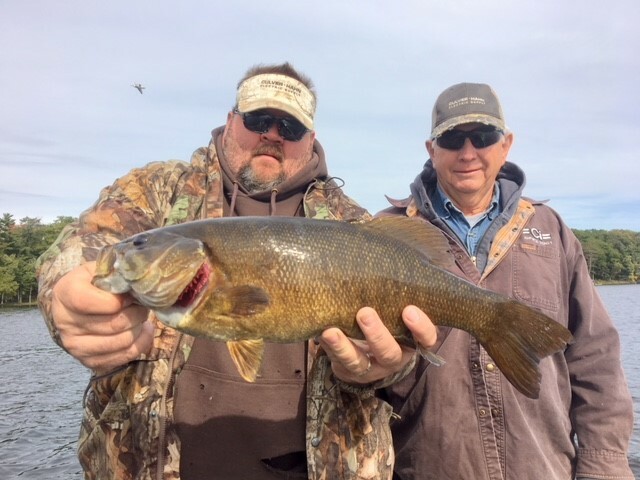 It didn’t take us long to get into some good smallmouth bass up to 20″ drifting minnows on live bait rigs along rock edges in 10′ of water. Tight lines and bent rods. Even if it’s a Loon… We were under attack, and the guys were wondering what I did to get all of the birds worked up?… They can be a real pain this time of year but we worked through it. That’s the biggest Loon we’ve every hooked Jeremiah!!! Relax bird lovers. The Loon will be OK! After lunch at Angler’s Haven we caught a few more smallies, but the bite was slow with fish hard to locate. Time to look for some walleyes. They’ve been tough to get lately, but I think we may have pinned them down. We started looking off deep reef edges in 35′ -40′ of water and found groups of fish stacking up. After anchoring up on them my crew put some nice eyeballs up to 19″ in the net using jigs/minnows and slip bobbers/minnows. Water temperatures are still hanging around 60 degrees, but we’ve got some really cool nights in the forecast that should drop those temperatures significantly. Wasn’t it 90 degrees just a few days ago? Thanks for another great day Jeremiah and Marvin. Always great to see you guys! I’m not sure where to begin here… Sometimes people just deserve a fish, and that was the case on Friday. Wayne Fletcher (Hubertus, WI) was back in the boat for Day#2 of his musky trip in the Hayward area, and we were ready to get a little revenge from his first day on the water. If our first day was tough, this one wasn’t a whole lot easier… Fall weather is coming in fast, and we had to deal with gusty winds, rain, ice, and cool temperatures. Water temperatures were actually falling throughout the day. We started at 59 degrees, and ended at 58. It’s a little early for Old Man Winter to show up, but we’ll play the hand we’re dealt. Wayne and I pounded water throughout the morning and our only action came when a good looking fish smashed the swim jig I was throwing. It didn’t stay buttoned up though, and we went into lunch still searching for one in the net. More nasty weather beat us up in the afternoon, but we stayed the course. Our best opportunity came around mid afternoon when a fish grabbed one of the suckers we were dragging. Everything seemed to line up right, but the fish came unbuttoned when Wayne put the hooks to it. The struggle was real, and we couldn’t buy a break! We continued to plug away and chop water throughout the afternoon when I moved us to a historically good spot for the final push. Almost instantly, a musky smashed one of our suckers on the outside edge of a weed line in 10′ of water. Wayne connected and put a really stout mid 30’s musky in the net. Sometimes you just have to grind it out, and today was one of those days. Right fish, right time, and right guy. Congratulations Wayne. That’s one of the hardest earned fish I can remember. You deserved it my friend! The weather man was right on Saturday… Cold temperatures were in the forecast, and he was on the money. 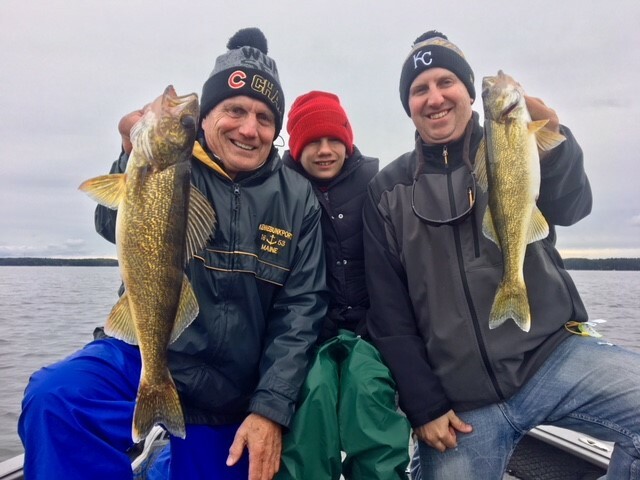 I knew we were going to pay for all of that hot weather in July and August… Randy & Jackson Hampton (Verona, WI) were back with Dave Schroedel (Madison, WI) fishing out of Angler’s Haven in Hayward. These guys are die hard Badger fans, and my kind of gang… I’m definitely not ready for winter to set in, but I don’t think we have a choice. We bundled up and began our day looking for walleyes. I’d located a good school of fish a few days ago, and they were exactly where they were supposed to be. We anchored up on a stack of fish in 35′ of water and gave them a variety of presentations from jigs and minnows to slip bobbers and crawlers. Jigs and minnows won out, but it wasn’t an easy bite. We caught a few up to 17″ and missed a few. There were lots of short hits and misses, and it was pretty obvious that they weren’t exactly in an eating mood. Our good friend Terry Peterson rolled in while we were eating lunch and making plans for the afternoon. He mentioned a good crappie bite that he was on, and we were all about it. Talk about good timing!!! We switched lakes, and as always “The Professor” was right on the money. Fish were stacked up in 25′ of water, and my crew worked over a bunch of solid slabs up to 12 1/2″ using slop bobbers and plastics. Jackson was on point, and Dave was on fire. Randy and I couldn’t keep up with them! We put some good fish in the tank for a fry, and it was a really good way to wrap up our day. Thanks for the tip Terry! Water temperatures are holding around 58 degrees and will probably continue to drop if the forecast holds true. Great job today fellas. Always a good time with lots of laughs. Row that dang boat Jackson… Go Bucky! With fall arriving so abruptly and water temperatures dropping accordingly, I’m seeing signs of turnover happening on our inland lakes. Water clarity is a bit goofy and the thermocline beginning to disappear on some bodies of water. There wasn’t much of a transition into the fall bite, but nobody should be surprised with the way this season has gone. If the weather man is right, cool temperatures are here to stay. As long as the fish cooperate, we’ll be OK!!! Jim Pones Jr. from Villa Park, IL returned for his annual musky trip in the Hayward area on Sunday. Last year he put a hard earned musky in the net after a long day of tough fishing. Weather conditions were decent this time however with partly cloudy skies and light west winds. I had a feeling we’d get into something… It didn’t take long before I had a fish grab the swim jig I was throwing at boat side but couldn’t connect. There was a couple of more good follows on the swim jig before a sucker that we were dragging got smashed. That’s exactly how it’s supposed to happen. Jim put the hooks to it, and we were on the board with a solid 40″ fish in the net. It was his personal best, and he did and excellent job making it happen. We had another follow on the swim jig before noon to wrap up a fun and eventful morning. After some lunch we set out on lake # 2, and we quickly had another encounter. I had a fish come in hot two times on the swim jig, and it grabbed the sucker we were dragging. Perfect. Apparently the musky didn’t get the memo however, and it dropped the sucker. Musky guys are persistent… We came right back at that fish, and it grabbed another sucker instantly as we came through the same spot in 10′ of water off of a mid lake reef. Again, it dropped the sucker… That fish has commitment issues, and it’s costing me some $$$. That’s always a tough pill to swallow, but no worries. We had lots of action and put a good fish in the net. That was a good day of musky fishing! Water temperatures have settled in to the mid 50’s, and there’s no doubt that we’ve tuned the corner into the fall weather season. Awesome job today Jim. You nailed it, and I hope those arms feel better tomorrow!!! I’ve been looking forward to my trip on Monday for a couple of reasons… First of all, two really good guys were going to be back in the boat with me. Good buddies Dave Russ and Jim Hanneman from Merril, WI were back for their fall trip, and Jim was bringing along some of his “Secret Recipe” venison sausage. I can’t tell you how good that stuff is!!! 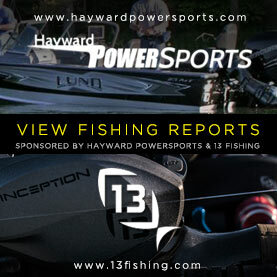 We fished the Hayward Lakes area and began our day targeting walleyes. We’ve been on a good school, and thought we had a good chance of finding some hungry fish. The cold weather has dropped water temps right where they need to be in the mid to high 50’s, and it’s time for these eyeballs to join the party… It didn’t take us long to find fish holding along a mid lake reef in 30′ – 40′ of water, but our first stop was a bust with two missed fish and nothing else. Stop #2 was a different story however, and we got in a groove. Dave and Jim put some solid fish in the net up to 19″ using jigs and slip bobbers with minnows. Action was steady, and it didn’t take long to get the fish we needed. With the walleye itch scratched, I didn’t have to twist arms for switching to crappies in the afternoon. We were on a good bite the other day, and my crew was all about it. We switched lakes, and it didn’t take us long to roll up on a huge stack of fish in 25′ of water. The rest of our time was spent putting some real slabs up to 13 1/2″ in the boat, and it was one of the most impressive days of crappie fishing I’ve seen in quite awhile for size and numbers of fish. Couldn’t have happened to a better couple of guys. We laughed, told stories, caught fish, and the Brewers won their division. That’s a hard day to beat! We’re going after seagulls next year fellas, and don’t forget the venison sausage Jim. Dang, that’s good stuff!!! I’ve still had a hard time getting back to Lake Superior and Chequamegon Bay. It’s been completely circumstantial, but I hear that the smallies are starting to put on the feed bag. If weather permits, I’ll definitely have some direct information from there in my next report. We’ve only got a few weeks left of our open water season, and I always hate to see it come to an end. We’re going to squeeze the life out of every day, and catch as many fish as we can. How about those Milwaukee Brewers? Go Brew Crew!! !